Woofs to Chewy.com for making the process of finding healthy dog treats easy and delivering them straight to my doorstep! This month they delivered some biologically appropriate freeze dried raw treats by Orijen to me and I couldn’t wait to taste them. Orijen Free Run Duck dog treats are single-protein, whole prey treats. The duck in Orijen Free Run treats are raised cage-free on natural grains and well water in Ontario, Canada (they are a Canadian company). These treats are made without preservatives; they are gently freeze dried to lock in all the natural, healthy goodness. As you can see, Orijen Free Run Duck dog treats are bite-sized which make them perfect for training and to bring along as a trail snack. They are soft treats and since they are freeze dried, you need to be careful because they will easily crumble. Lately, Ma has been taking some Free Run Duck dog treats on our evening walk to share with my buddy, Bentley. He loves them as much as I do! And my new puppy friend, Kya, seems to enjoy them too. Orijen Free Run Duck dog treats are super healthy – they are made of Duck meat and Duck liver. There are no grains, carbohydrates or additives and they are only 7 calories per treat. As with most freeze dried dog food and dog treats, you will want to make sure your dog has access to fresh, clean water since the treats are dry. Even when we take this type of treat on the trail, we always have water around just in case I need to wash them down. 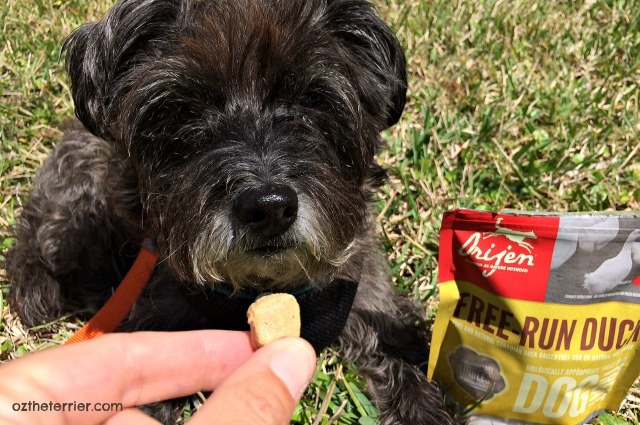 Have you tried Orijen’s Biologically Appropriate dog treats? Run over to Chewy.com and get some for yourself! 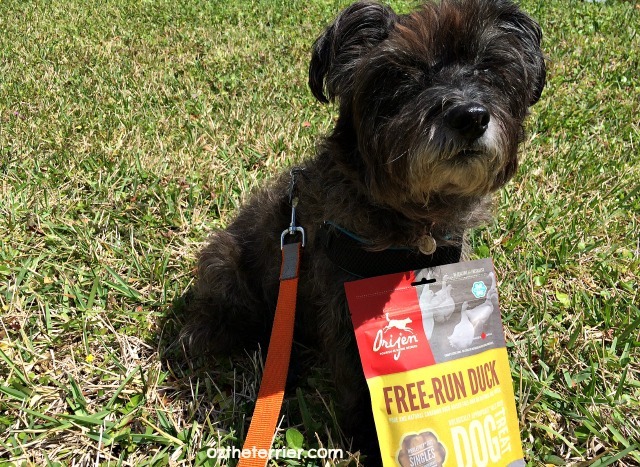 As a Chewy Influencer, I received one bag of Orijen Free Run Duck dog treats from Chewy.com in exchange for an honest review. I received no other compensation for this post. 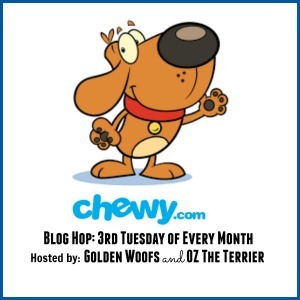 Join me and Sugar the Golden Retriever in our monthly Chewy.com blog hop! Link up your Chewy Influencer post and share the deliciousness! Free run duck??!! Our ducks do free swimming and free flying, but we've never seen them run. They sound good, though. Oh I luffs Duck, these treats sound just pawfect fur me! We absolutely love these treats too!! Oh those due look yummy - I will definitely hafta tell mom'bout theze an'she NEEDZ tue git me sum! Great review. How nice of you to share your treats. It's funny you and Sugar are both reviewing Orijen products this month. Orijen is a tasty brand. Bentley and Pierre LOVED these duck treats! They get so excited whenever Chewy.com makes a delivery. We use them for nose work sometimes. Good stuff. WE love duck food so we would love duck treats!!! Oh my...Arty just adores duck, we will have to put these on our "must try" list!! Orijen makes great products!!! And we do enjoy duck very much. Thanks for the review, we will have to get Mom to let us try them too. Those look very tasty. We will have to look for those when we are shopping next time. Too bad they're not shaped like ducks. I've never tried Orijen yet. I want some duck. They sound yummy.